Our teen staff says to check out Coldplay, She & Him and The Velvet Underground. For good reads our staff writers recommend Inheritance and A Certain Slant of Light. Essay contest: Is it OK to lie? Our essay contest winners say it depends on the situation. These are letters we received about stories that appeared in the November – December 2011 issue of L.A. Youth. 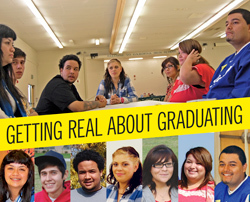 These former dropouts talk about their second chance at a diploma. A new program called the Diploma Project is trying to reduce dropout rates at Los Angeles Unified School District schools. We talked to students from Fremont and Gardena, two high schools that are part of the Diploma Project, about why they dropped out and what helped them return. They were all thankful for the Diploma Project for helping them get back on track to graduate. It was scary when Jennifer's mom lost her job and she saw her having trouble paying her bills. From dog-walking to baby-sitting to doing henna tattoos, these teens found ways to earn cash without a regular job. Making comics started as a way to fight boredom in math class, but it’s become something Austin loves. Every year 17-year-old Merryck makes a resolution even though she's always failed. More than 1,850 students told us how budget cuts have hurt their schools. It was tiring but fun for Edda, 17, and her friends to camp out for the Rose Parade. Getting sick all the time made Julia realize she couldn’t work so hard. After years of hoping her dad would be more caring, a girl finally has a father figure who is. Sarah, 14, says it's not a waste of time if you try to get a good workout.